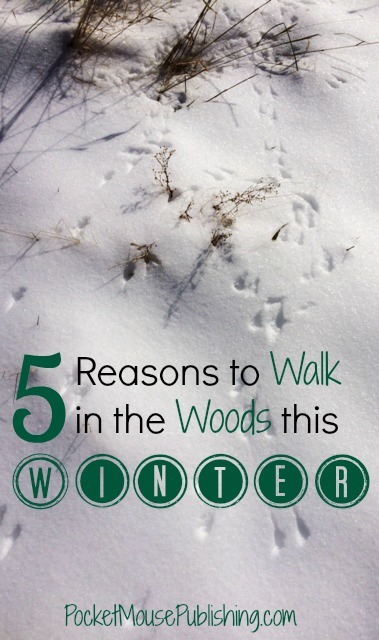 Need a reason to go for a walk in the woods this winter? I have 5 for you today! You can hear more. Ever walked in the woods when it was snowing? Remember the hush? Even when it isn’t snowing, a winter nature walk is quiet. No insects are singing, so you can easily distinguish the bird calls you do hear. You can see more. When you do hear a bird call, you can find the source easily. You can point it out to your children before it disappears among the leaves. You can see more than just the flash of a fox, you can watch it run – flaming orange against the white snow. And the tracks! So many tracks on the new fallen snow. You don’t have to worry about poison ivy, ticks, or thorns. This possibly should have been #1. As the mom who has to remove the ticks, bandage the cuts, and prepare the soothing compresses, I love not having to worry about what the children will bring home. You get more exercise. Breaking though a foot of snow can be hard work. Your body warms up, and you feel good! And because you’re hearing more, seeing more, going farther and discovering you things without worry, you don’t want to stop. As Jean said we are on the cusp of spring, less than a month until the Vernal Equinox (March 20, the first day of spring). There is still time to walk in the woods in winter though. Remember these 5 reasons when you’re wondering if all the bundling and preparation to “go outside” is worth it! What is your favorite thing about walking in the woods in winter? < Previous What is a Naturalist? We experienced so many of these this winter, and I can definitely attest to the fact that walking the woods has made this cold season one of the best I’ve had with my family. Thanks so much for writing! I think there’s something to love about every season and you definitely capture the beauty of winter in this post! Growing up in Sweden I was raised according to the old saying “There’s no bad weather, only bad clothes,” and I still make a point of getting outside every day. It makes a world of difference for my well-being. Thanks for linking up to the #outdoorplayparty! Hope to see you back soon. My winter walks have been a little thin on the ground this winter with all the icy sidewalks, but we have gotten to go cross country skiing, and that has a lot of the advantages of a winter walk. You can go slowly or stop and listen, you can cover a lot of ground and see the animal tracks cross the ski trail, and it’s great (poison and tick free!) exercise. I’d love to snow shoe some day too. Love all your thoughts about nature and kids, Lee!